Geoff Ind Animation: Using reference when planning texture and surfaces for a 3D character. 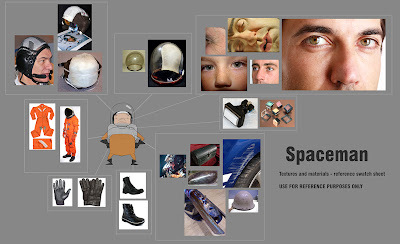 Using reference when planning texture and surfaces for a 3D character. 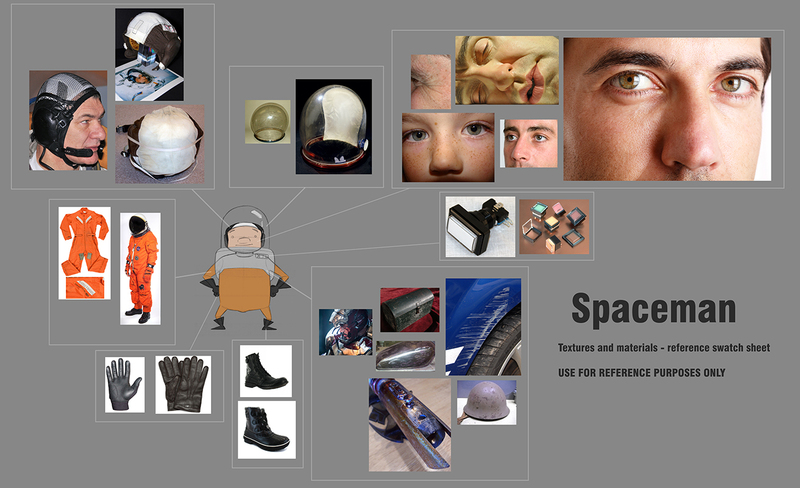 I have just completed the texture/material swatch sheet for the Spaceman. This sheet will be used to inform allot of my decisions regarding materials for each of the different areas of my character. I will be using it to help incorporate more detail that I would not normally have thought to include if I there was not a sheet to look at to help guide the texturing process. I also like to use it to identify material attributes that help to distinguish one type of material from another, for example glass and scuffed painted metal. Both are a hard smooth surfaces but glass will have a sharper specular highlight than the metal surface. Here is my swatch for the character, this version is way smaller than the original file. The idea with a texture/material swatch is that you can zoom right in close to the texture to observe as much of the detail as possible. Unfortunately this means that the actual file usually absolutely ginormous, this one is over 13,000 pixels wide and nearly 10,000 pixels high! Way too large to upload on my blog. Texture and Surface material swatch sheet, FOR REFERENCE PURPOSES ONLY. Just a quick word on using reference material. I personally think using reference material to help inform your craft is a great thing. Reference when used properly, can't help but make whatever it is you are drawing, painting, sculpting, etc more detailed and rooted in the real world. When used incorrectly however i.e. copied reference material can make your images look disjointed and muddled. I mainly use reference as a tool to inform me about small details that often get over looked by the lay person. For example I keep a library of images and video files of a huge range of subjects so that if I'm designing or drawing anything from a deserted run down old street to a pristine street I can look at images of ruins, brickwork of varying ages and levels of decay so that I can accurately draw and place small details into my image to help root it in reality. for example where weeds usually start growing from or where dirt and debris usually accumulates. I also use reference to help me draw or paint things that I have never painted before, an artist rarely if ever has painted or drawn every single type of tree known to man so when drawing something new, I always use reference to help me get started. A recent example of this was when painting the underwater scene from an earlier post I had never drawn or painted light reflecting off of water before as caustics. So I had to get heaps of reference images of reflections of water to have a look at patterns etc so that my painted caustic patterns looked vaguely realistic and correct at a glance. Looks like I'll be working on a commercial job for the next week, so I'll try and post more of my progress afterwards.